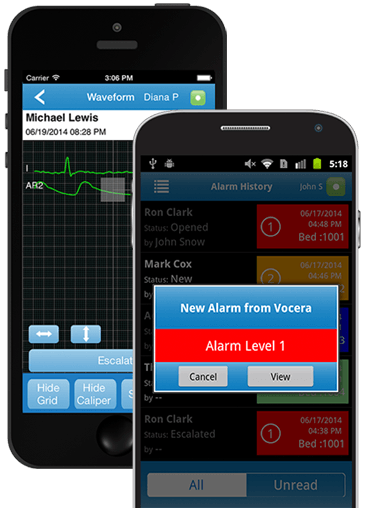 Secure Text with Alarms and Alerts. Most care team communication occurs in response to patient events. 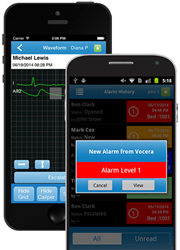 This is why the Vocera Engage Mobile app’s integration of clinical alarms and alerts with secure text messaging is so powerful. When an actionable event occurs, clinicians receive notification regardless of the medical device or clinical system from which it originates. From the notification, the caregiver can initiate a secure text message that’s accompanied by relevant information about the patient, care team, and the event. This eliminates the need to transcribe patient events, which can help speed response times. The app runs on Android and iOS devices.